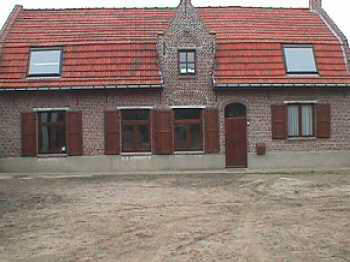 Charlotte Descamps and her family operate the Varlett Farm B & B near Poelcapelle and Passchendaele in the Ypres Salient. Charlotte has become a student of the old battlefield and has her own collection of its archeological remains. She will be sending us photos and translations of newspaper articles concerning events in the Salient. Her website and email addresses are at the bottom of the article if you would like to contact her. While Simonne Deleu was cleaning her windows on the 21 February, she suddenly fell into the ground. The ground under her feet disappeared and she fell into a hole of 2,4-m depth. 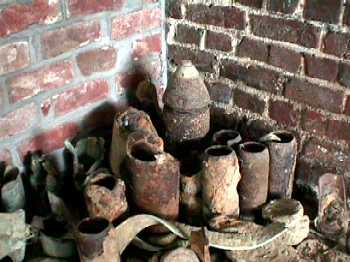 It appeared that under their farm buildings there was a First World War dugout. Francky Bostyn, Jan Van Coillie, Peter Barton and Johan Vandewalle decided to investigate the case. They are busy to make an inventory of underground constructions in the Ypres Salient, for quite some time now. According to Francky Bostyn, who is a licentiate in history, this dugout is a place where approximately 45 soldiers could stay. On the left hand side there is an officer's room situated on the highest place, which made this room the driest one. It is also larger so that larger bed could fit in but it is in very poor condition. The wooden construction is mainly made of spruce wood. Although a lot of the girders have disappeared, the dugout did not collapse. This proves that the pressure is not too high. According these investigators this is a German model. Johan Vandewalle says: The British dugouts were build much deeper, mostly in the solid blue clay. Apart from that the way this dugout was built points out a German origin. As a carpenter and a former tunnel constructor, Johan Vandewalle is the technical specialist. 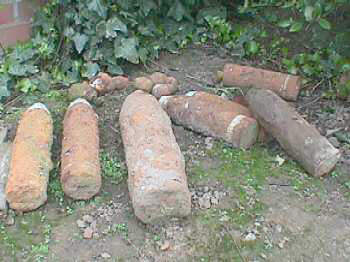 Seven years ago, he started to research tunnel in the Zonnebeke area and in the meantime he discovered ten of them. The main thing for farmer André Callens is the safety of his farm. He wants the part the part of the dugout situated under the dwelling house to be removed. The hole should be filled up with concrete to reassure the stability. The investigators consider it possible to reconstruct the dugout on another place." We are able to save the materials and to reconstruct it but we need money for that. A part could be obtained from a national disaster fund. The rest has to be raised in another way. We still need about 100.000 Belgian Francs" says Francky Bostyn. That is why the 4 diggers are working on a special association without pursuit of profit called: The Association for Battlefield's Archaeology in Flanders. It is a co-operation with England in order to localise and investigate elements of the First World War. The universities of London and Greenwich would participate amongst others. Charlotte will be sending photos of the Farm Callens Bunker. Check Back.